The diminutive Stuart Lewis-Evans came from a racing family, and after a three-year apprenticeship at Vauxhall Motors, he cut his teeth in various formulas and it was not overly surprising when he was offered a Formula One drive in an outdated Connaught Type B at Monaco in 1957. He finished an impressive fourth, attracting the attention of Tony Vandervell, owner of the rising Vanwall team, who immediately gave him a drive. The car was intermittently good, and amid disappointments he won the non-championship Moroccan Grand Prix, and took pole at the final world championship event of the season in Italy. 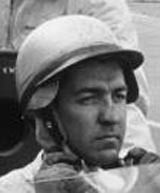 In 1958 he continued to show improvement with podium finishes in Belgium and Portugal, while Vanwall's senior drivers, Stirling Moss and Tony Brooks shared six wins. Lewis-Evans continued to be dogged by his car's performance, however, and he only finished three out of eight races. In the final race of the season, the Moroccan Grand Prix, he crashed when his engine seized and he was hurled into crash barriers at speed before his car burst into flames. He was airlifted back to the UK but died of his injuries six days later. It cast a dark shadow over the team's win in the inaugural constructors' championship, Vandervell was so upset he quit the sport at the end of the year.